This mod replaces the unit floating icons with period tactical symbols native to the armies they represent. 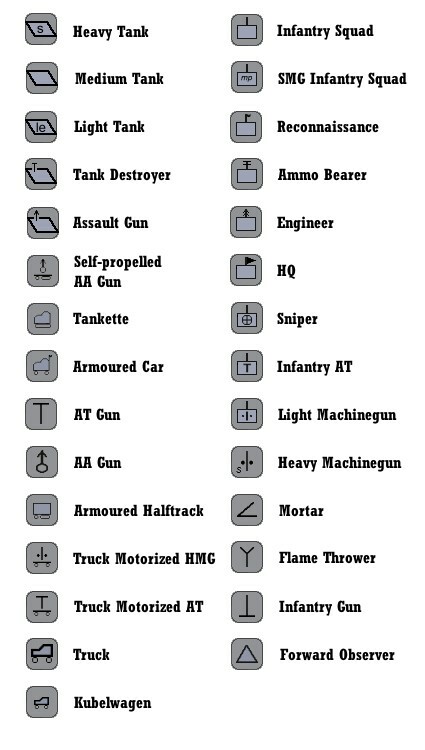 This is the version for Combat Mission Red Thunder and includes icons for Soviet and German units. Is this in the wrong thread? Nope, really CMFI icons - unless I made a mistake. Now you are making me nervous. As I mentioned in the CMBN thread I forgot to create the Americans key or take a sample pic. Once I do I will update this thread but probably not the mod. The German ammo bearers are a bit of a stretch. I used the symbol for supply units which are really rear area only but I figured using that would be better than something I made up. "This is the version for Combat Mission Red Thunder and includes icons for Soviet and German units." I looked at this mod and didn't see any Russian icons, so this is for CMFI, not CMRT, yes? Oops copy and paste followed by not tweaking the text. I just fixed it but it seems like you cannot just update the description in real time. Hopefully my update will not cause a removal of this file and a creation of a new one when all I want is to update the description. Yes, the download is for CMFI. I'm using these icons with CMFI and the also using the CMBN version and both are excellent! Many thanks for the work done to create this mod. Great, I am glad you are enjoying them. As hinted at in other thread, love it, use it !